This is the important cultural property of Japan, The Five Pure Land Patriarchs (Jodo Gosozo) of the 13th century, possessed by Nisonin Temple, Kyoto. It has been said that this is the picture which Chōgen (重源) (1121-1206) brought to Japan from China, being asked by Master Honen (1133-1212). However, historical studies show this lineage cannot be seen nor found in the records of "Kousouden (literally means "biography of high priests") during T'ang and Sung Dynasties. Names and their explanations were listed but not in a same lineage. There were many other names, too, listed. According to Professor Junji Wakasugi, this Master Honen Shonin's unique selections of five priests are based upon the passage in his Senchakushu. "Question: The various schools and sects of the Holy Path each have their own direct line of master-disciple transmission of the Dharma. (Omission) Is there any record of such a lineage of successive teachers in the Pure Land school?" Answer: The Pure Land school does indeed have its own lineage of transmission just like those of the Holy Path. However, within this Pure Land school, the lineages differ according to the various masters. These are the lineages advocated by the Dharma master Hui-yuan 慧遠(334-416)of Lu-shan廬山, by the Tripitaka master Tz'u-min慈愍三蔵(680-748), and by Tao-ch'o 道綽and Shan-tao善導. Here we will limit ourselves to the lineage advocated by Tao-ch'o and Shan-tao, and discuss its lineage of Dharma transmission. Concerning it, there are two opinions. According to one (found in the An-le chi/Anrakushu), the succession is as follows; the Tripitaka master Bodhiruchi　（菩提流支三蔵, the Dharma master Hui-chu'ung慧龍法師, the Dharma master Tao-chang道場法師, the Dharma master Ta'n-luan曇鸞法師, the Dhyana master Ta-hai大海法師, and the Dharma master Fa-shang法上法師. According to the other, the succession began with the Tripitaka master Bodhiruchi, who was followed by the Dharma master T'an-luan, the Dhyana master Tao-ch'o, the Dhyana master Shan-tao, the Dharma master Huai-kan, and the Dharma master Shao-k'ang (found both in the T'ang kao-seng chuan (Biographies of Eminent Masters Complied in the T'ang Dynasty) and in the Sung kao-seng-chuan (Biographies of Eminent Masters Complied in the Sung Dynasty)). Here again, Master Honen said "those lineages were found in the both Biographies of the Eminent Masters Complied in the T'ang and Sung Dynasties" However, none of the biographies of the Eminent priests mentioned these lineages in the Senchakushu. 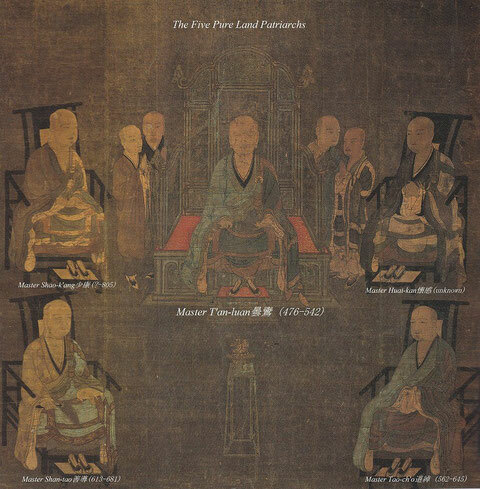 Therefore the picture of The Five Pure Land Patriarchs (Jodo Gosozo) which Chogen brought back to Japan from China, played an important role to show everybody that Jodo Shu indeed have a lineage. 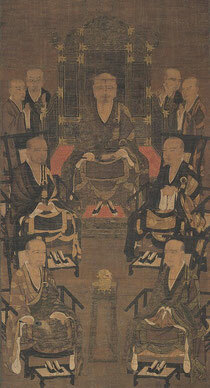 Originally, five priests in the picture above may not be the Five Pure Land Patriarchs (Jodo Gosozo) . But by declaring these five were the Five Pure Land Patriarchs (Jodo Gosozo) , Jodo shu was able to establish the basis to spread out. Based upon the picture above, more pictures of five pure land patriachs were copied as Jodo shu spread out. The following picture, possessed by Chionji Temple was considered to be imitated from the Nisonin Temple's picture during the 14th century. The first five patriarchs of the Jodo Buddhism. He is also the third of the seven patriarchs of Shin Buddhism. T'au-luan studied philosophy of Nagarjuna (Jp.Ryuju) and later studied Taoism. However after experiencing fatla sickness (near death), he met the Tripitaka master Bodhiruchi　（菩提流支三蔵) and entered Pure Land Path. From Master Bodhiruchi, he received Meditation Sutra/Kanmuryojukyo and developed the six-character phrase "南無阿彌陀佛" (Namo Amituofo/Namu Amida Butsu) (from Sanskrit to Chinese ) used throughout Pure Land Buddhism today. He is also regarded as the founder of the Ssu-lun(shiron) 四論宗Sect of China. He wrote many books on the Pure Land teaching, such as Chin-t'u-wang-sheng-lun-chu (jodo-ojo-ron-chu浄土論註), Ts'an-o-mi-to-fo-chieh (San-amidabutsu-ge讃阿弥陀仏偈), and Ryakuron-anrakujodogi略論安楽浄土義. The second of the five patriarchs of the Jodo Buddhism and the fourth of the seven patriarchs of the Shin Buddhism. Tao-cho once visited the temple of Tan-luan, and read an inscription on the wall that venerated Tan-luan. Tao-cho was so impressed by this inscription that he took up the pursuit of Pure Land Buddhism over his previous studies. His teaching is largely based upon kuan-wu-liang-shou-ching (Kammuryoju-kyo). He wrote the An-lo-chi (Anraku-shu安楽集) in two fascicles. The founder of the Zendo School of Chinese Pure Land teachings. In the year 641, he visited the temple of the famous Pure Land master, Tao-cho, who happened to be giving a lecture on the Contemplation Sutra. This lecture ultimately inspired him to follow, and then spread the Pure Land Teachings. His school follows the teaching of T'an-luan (Donran) and T'ao-ch'o (Dshaku). The third patriarch of the five patriarchs of the Jodo Buddhism. He was also regarded as the fifth great master of seven great masters of the Shin Buddhism. He wrote, among others, the following five books: kuan-ching-su(kangyo-sho観経疏), Wang-sheng-li-tsan(Ojo-raisan往生礼讃), Fashih-tsan法事讃(H), Kuana-nien-fa-men(Kannen-ho-mon観念法門), and Pan-chou-tsan(Hanju-san般舟讃). The fifth of the five patriarchs of the Jodo Buddhism. When he was 15 years old, he received precepts(entered a priesthood) and studied vinaya or the rules of discipline that the Buddha set forth for the monks and nuns. In 785, at Hakubaji temple in Lo-yang, he was inspired by reading a writing of Master Shantao which lead people to be born in the Pure Land. Further he prostrated in the hall of Master Shan-tao and joined in the Pure Land gate. He spread out the practice of Nenbutsu among people and he was called "Post-Shan-tao". Dear Ishikawa Sensei- Thank you for your work on this. It's very important and informative.